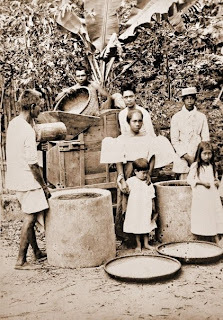 The "Lusong" is the wooden mortar where they pound the rice with a wooden pestle called "Halo" or "Pambayo" to separate the chaff from the grain. The island of Luzon is said to derive its name from this mortar seen in every house as pounding rice was then a daily grind. Then a winnowing basket called "Bilao" is used to separate the chaff or with the bigger contraption called "Kiskisan" where a fan is turned by hand to blow the chaff away.